THE management of Krif Ghana Limited is marking the company’s 27 years of dealing in German office products and stationeries in Ghana with a 27% price cut on all German products in Krif Shops across the country. The stationery and equipment dealer has, over the years, dealt in some German office and stationery brands such as Pelikan, Tessa, Herlitz, Durable, Olympian, among others. 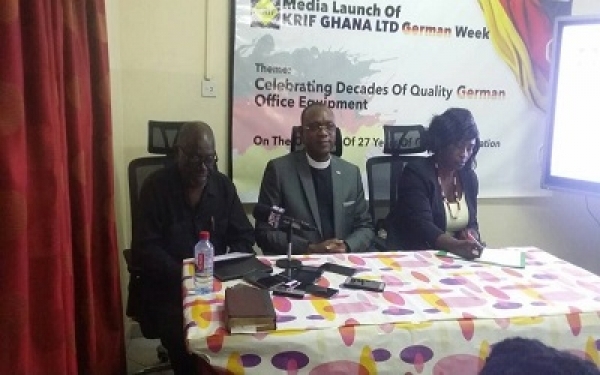 Speaking at the launch of the German week celebrations, Reverend Kennedy Okosun, Executive Chairman of Krif Ghana, said his company is the only one in Ghana that deals in quality German products spanning decades. According to him, the German manufacturers provide solutions in office equipment and stationeries, and there was the need to promote their products. He noted that Krif Ghana is a member of the Ghana-Germany Economic Association (GGEA), which was set up to promote investment and trade between Ghana, and, therefore, believes doing business with German products will afford the company opportunity to actualize its vision to bring quality products to the Ghanaian schools and offices. Consequently, he said,the company is promoting that agenda in order to bring German quality products to the doorstep of Ghanaians. He, however, explained that although the company deals in German products, it equally sell and deals in indigenous products such as chalk,which is produced by some members of the Ghana Federation of the Disabled. As part of the activities, he announced the company will undertake some school enhancement activities such as painting competition among selected schools in Accra. On his part, the Executive Secretary of Ghana German Economic Association (GGEA), Mr AsafoAdjei, said the purpose of the association is to promote Ghana-German bilateral relations. He noted that Ghana and Cote d’Ivoire happen to be the major beneficiaries of German trade in the sub-Saharan Africa, adding that the association was happy to be part of the celebrations. The week-long celebration is on the theme: ‘Celebrating decades of quality German office equipment’.